As part of the hotel group’s global expansion plan, Fairmont has announced that it will be opening Fairmont Jaipur in India on August 9, marking the brand’s entry into the country. Known as the Pink City, Jaipur is the capital and largest city in the Indian state of Rajasthan, with historical landmarks including Amber and Jaigarh Forts and the Jantar Mantar observatory. For our recent four-hour guide to the city click here. Situated within India’s Golden Triangle – which is home to palaces, fortresses and landmarks like the Taj Mahal – the 255-room hotel features a traditional Mughal palace design. 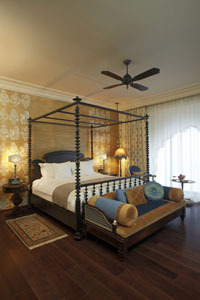 Rooms have a modern and sophisticated style, with a touch of Jaipur’s cultural characteristics. The hotel features a number of restaurants and bars, including Zarin for Indian cuisine, an all-day dining restaurant Zoya, tea lounge Anjum, a Masala Chai station that serves Adrak Wali Cha (ginger-infused tea), a library bar called Aza and the smoking room Cigar Diwan. There is 5,500 sqm of meeting space and a 1,300 sqm Willow Stream Spa. The hotel also offers tea in the gardens and traditional entertainment and dancing in the courtyard. “Jaipur offers not only a strong leisure product but the conference center at our resort and other properties developing nearby will allow the city to capture the MICE and events market, which is a core competency of Fairmont. We believe India is well poised for healthy growth in both the luxury leisure and business travel markets,” a Fairmont spokesperson said. An introductory package called the “seeing is believing package” is available through October 31, 2012, and offers a third night complimentary when booking for two nights. Rates start at INR10,000 (US$ 180) per night for double occupancy, down from the regular INR18,000 (US$322). The package includes a variety of cultural experiences such as a village walk, traditional folklore storytelling and Rajasthan dance show. 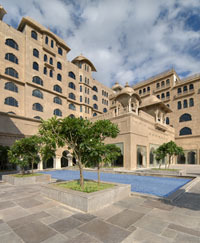 For more information, visit www.fairmont.com/jaipur.